For as long as I can remember I have always had a passion, flare even, for makeup. I remember being bought my first makeup set one Christmas when I was 13, and then spending the rest of the day experimenting with different looks. I would wear makeup whenever the opportunity presented itself, and I have always considered that makeup is, on a day to day basis, something to enhance what is already there. That said, I love nothing more than watching a face transform under the touch of a brush. That is the beauty of makeup, it can enhance what you already have or completely change a face – the possibilities are endless. Whenever Family members and friends needed makeup doing for an event/occasion I was the one that was asked and this is what ignited my passion for doing makeup on other people. Seeing people’s reactions when I have finished is one of the things that makes my job as a makeup Artist so rewarding. 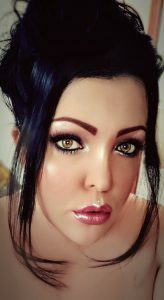 Even before I started College, I had always wanted to work in makeup but, at the time, I was steered away from the Beauty Industry as it wasn’t considered to be lucrative. Instead, I ended up working in the Legal field, all the while still doing makeup for friends, family, and even colleagues as a sideline (and sometimes even in the Office!). I am mostly self-taught. This has come through many hours practising different looks, YouTube videos, books, etc. Don’t get me wrong, I have definitely had more than my fair share of Makeup Faux Pas; I’m just grateful that smartphones and cameras weren’t as readily available as they are now! I did enrol at a Makeup School but, due to ill-health, I was unable to complete the Course and all of the work I had done until that point was null and void. I am now doing an at home Course, which enables me to study in my own time and, hopefully, my illnesses won’t prevent me from completing it as there is a long deadline. You can find out a little more about how my illnesses have limited me and forced me to make one of the hardest decisions of my Makeup Career over on my Services page. I hope you have enjoyed finding out a little about me. Please be sure to connect with me on Social Media and subscribe to my YouTube channel.